We use our garage doors every day, but we often don’t think about how important they are to our daily routines. Garage door systems are also more complex than you might think. They contain several crucial parts that have to work properly, or they affect the entire system. The springs on your garage door system support the weight of the door while it opens and closes. With such a job, you can probably guess how important the springs are to the rest of the door. When the springs break, there are several potential causes. Below, we’ll go over some of the most common reasons for a spring on a garage door to break and how you can prevent that from happening. Modern garage doors are a terrific convenience, but they are also hundreds of pounds of wood or steel connected to a complex opening mechanism. That’s why garage door safety is an important issue for you and your family. It’s only natural that your garage door will make a little bit of noise. It is, after all, a complex mechanism, and mechanisms with moving parts are going to make sounds. However, there is such thing as a garage door that is too noisy. If you are dealing with an excessively loud garage door, you may have a bigger problem. Is there a way to repair a loud garage door? The short answer is yes, and here are some of the basics of a noisy garage door fix. Of the many problems you may encounter with your garage door over its life, one you might not be prepared for is a broken garage door track or a garage door that has come off the track. How do you know if this has happened? The door will look off-kilter and probably do nothing more than make a grinding noise and shudder a little bit if you try to open or close it. This is a problem you want to avoid and one to address immediately if it occurs. Your garage door is an important and convenient feature of your home, and it’s crucial to remember that your garage door also serves as a point of entry. In fact, thieves may see your garage door as the easiest access point, as most people tend to ignore garage door security — windows and doors are areas that are much more likely for a homeowner to reinforce. This seems like an easy one, and it is, but too few people ignore this idea. Keeping your remote in your car is fine while your car is in your garage, but the first time you decide to leave it parked in the driveway, a thief has an ideal opportunity gain access to your home by simply breaking your car window. Even if you never park in the driveway, thieves may follow you to local locations where you may park your car and steal the remote there. Take the remote with you. There is an emergency release lever near the front of your garage door that will allow you to open the door in case of an emergency. While this is a convenient safety feature, many people may not realize that an enterprising thief can slip a coat hanger under the door, catch the release lever and pull it to open the door from the outside. Loop a zip tie around the lever to prevent someone from being able to trip it from the outside. This may seem like an obvious one as well, but it’s important to keep in mind that it doesn’t take long for a thief to slip into your garage. 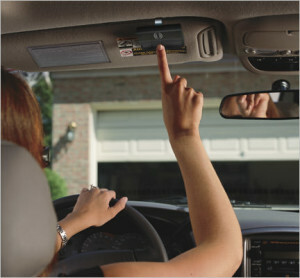 Do not leave the garage door open and unattended, and close the door promptly after you enter. If you are looking to purchase a new garage door, you can get one with custom privacy class. However, if you aren’t ready to replace your garage door, you can buy various sprays or films to put on the windows and prevent potential thieves from peering inside. It’s important that you take care of your garage door. Have a professional conduct annual or semi-annual maintenance. They’ll make sure all your parts are in good shape, that there is no debris interfering with the proper operation of your system and that everything is working correctly. This can extend the life of your door — and make it less likely a thief can exploit any weaknesses in your door and break in. If you need garage door maintenance, repair or a new door with customized glass in the Seattle area, trust DistribuDoors. You will find a wide selection of quality Clopay® garage doors, along with professionals who have the experience to service doors of all brands. We also offer state-of-the-art LiftMaster® garage door openers with Security 2.0+, which includes a rolling code lock system to make it nearly impossible for thieves to hack your garage door. These garage door openers also include Smart technology that allows you to open and close the door remotely through an app on your phone, automate the opening and closing of the door and alert you when the door is being used for even greater security. Contact us for all the details or for an estimate on service today.